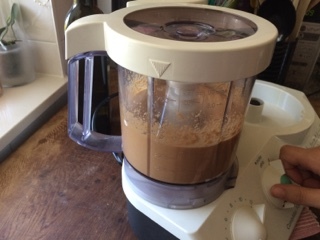 1 Transfer the peanuts to a food processor or blender. If you toasted your nuts, do this while the nuts are still warm. Pulse a few times just until chopped. For chunky peanut butter, remove 1/2 cup of chopped nuts and set aside. 2 Run the food processor or blender continuously for 1 minute. Stop and scrape down the sides and bottom of the bowl. 3 Run the food processor or blender continuously for another minute, then stop and scrape down the sides. At this point, the butter will start clumping together. It's not quite peanut butter, but it's getting there! 4 Run the food processor or blender continuously for another minute, then stop and scrape down the sides. 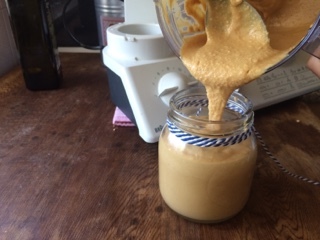 At this point, the butter will be glossy and soft, like very thick peanut butter. 5 Sprinkle the salt, oil, sweetener, and any other extras over the top of the peanut butter. 6 Continue processing the butter until it becomes completely smooth. Homemade peanut butter will still be a little more gritty than Skippy peanut butter, but should be spreadable at this point. Taste and add more salt or other add-ins to taste. If you reserved some nuts for chunky peanut butter add them now and pulse a few times to incorporate. 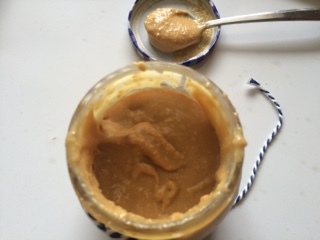 7 Scrape the peanut butter into a storage container, cover, and refrigerate. 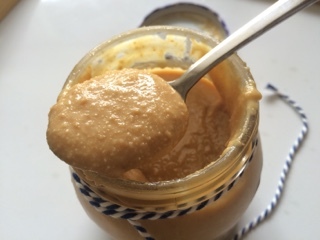 The peanut butter can be used immediately and will keep for several weeks in the fridge.